American family, especially prominent in New York and Philadelphia, and tracing its descent back to Jonas Phillips, who emigrated from Germany to England in 1751 and thence to America in 1756. 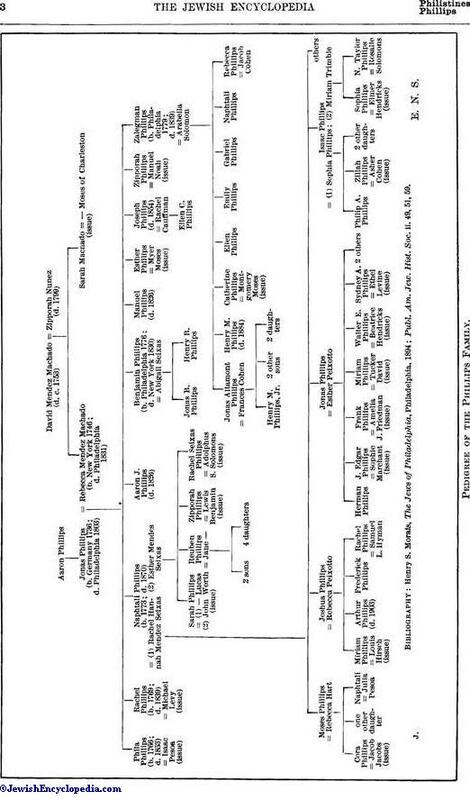 The genealogical tree of the family is given on page 3. Archeologist and numismatist; born at Philadelphia Sept. 6, 1838; died June, 1895; son of Jonas Altamont Phillips. He was well known for his studies in folk-lore, philology, and numismatics, both in the United States and in Europe. Two gold medals were conferred upon him by Italian societies for his writings. He was treasurer (1862) and secretary (1868) of the Numismatic and Antiquarian Society of Philadelphia, and a secretary (from 1880) and the librarian (from 1885) of the American Philosophical Society, as well as member of many other learned societies at home and abroad. Phillips' works on the paper currency of the American colonies and on American Continental money were the first on those subjects. His works have been cited by the Unid States Supreme Court in a decision on the "Legal Tender Cases." Among his writings may be mentioned: "History of American Colonial Paper Currency" (1865); "History of American Continental Paper Money" (1866); Pleasures of Numismatic Science" (1867); "Poems from the Spanish and German" (1878); "Faust" (1881); and four volumes of translations from the Spanish, Hungarian, and German (1884-87; see, Appleton's "Cyclopedia of American Biography," iv. ; Henry S. Morais, "The Jews of Philadelphia," s.v. ; Oscar Fay Adams, "A Dictionary of American Authors," p. 295, New York, 1897; "Proceedings of the American Philological Association," 1896). American lawyer, congressman, and financier; son of Zalegman and Arabella Phillips; born in Philadelphia June 30, 1811, where he attended a private school and the high school of the Franklin Institute; died Aug. 28, 1884. Phillips was admitted to the bar Jan. 5, 1832. Immediately after his admission he accepted the position of clerk of the Court of Common Pleas. In Dec., 1841, he was elected solicitor of the district of Spring Garden. In the October election of 1856 he was chosen a member of the thirty-fifth Congress and served during 1857-59. He addressed the House of Representatives on the admission of Kansas into the Union under the Le Compton Constitution on March 9, 1858, and on June 12 he spoke on the expenditures and revenues of the country. 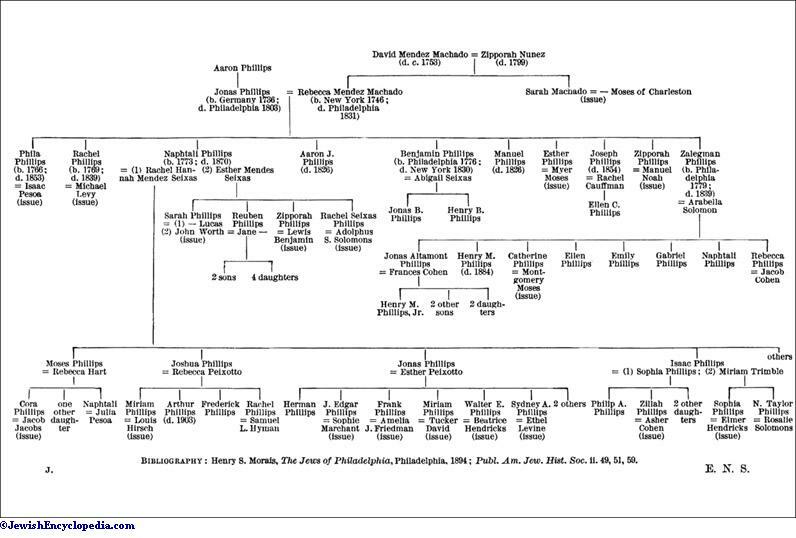 Pedigree of the Phillips Family. In Dec., 1858, he was elected grand master of the Grand Lodge of Free and Accepted Masons of the State of Pennsylvania, and was reelected in 1859 and 1860. On Dec. 4, 1862, he was chosen trustee of the Jefferson Medical College to fill a vacancy caused by the death of his brother J. Altamont Phillips, and subsequently became its treasurer. The Court of Common Pleas appointed him a member of the board of park commissioners May 13, 1867, and March 12, 1881, he was elected president of the board. He was appointed a member of the board of city trusts Sept. 2, 1869, became its vice-president May 11, 1870, and on March 13, 1878, was chosen its president, which office he resigned in Dec., 1881. In 1870 Phillips was appointed a member of the commission for the construction of a bridge crossing the Schuylkill River. He was one of the original members of the Public Buildings Commission established in 1870, but resigned the next year. In 1870 he was chosen a director of the Academy of Music, became its president in 1872, and resigned in 1884. He was elected a member of the American Philosophical Society in Jan., 1871, and a director of the Pennsylvania Railroad, Northern Central Railroad, Philadelphia, Wilmington and Baltimore Railroad, and of the Western Union Telegraph Company in March, 1874. He became a director of the Pennsylvania Company for Insurance on Lives and Granting Annuities on Oct. 16, 1874. On Dec. 20, 1882, he presided at the "bar dinner" given to Chief Justice Sharswood on the retirement of the latter; this was the last public occasion in which he participated as a member of the Philadelphia bar, of which he had become a leader. 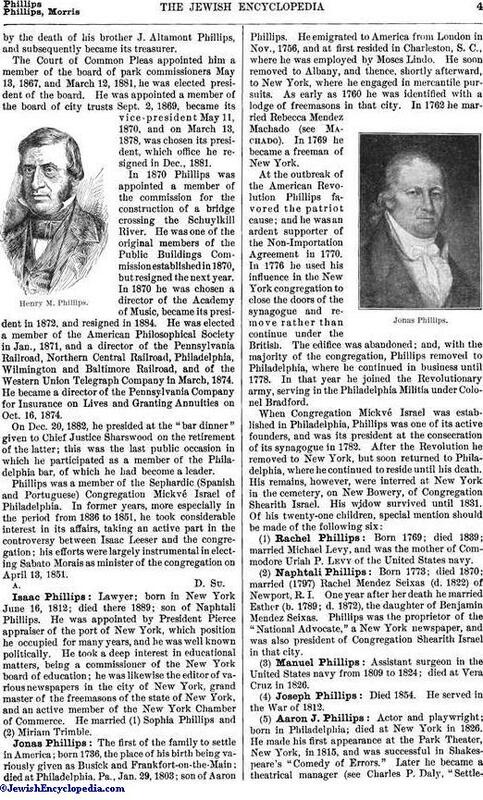 Phillips was a member of the Sephardic (Spanish and Portuguese) Congregation Mickvé Israel of Philadelphia. In former years, more especially in the period from 1836 to 1851, he took considerable interest in its affairs, taking an active part in the controversy between Isaac Leeser and the congregation; his efforts were largely instrumental in electing Sabato Morais as minister of the congregation on April 13, 1851. Lawyer; born in New York June 16, 1812; died there 1889; son of Naphtali Phillips. He was appointed by President Pierce appraiser of the port of New York, which position he occupied for many years, and he was well known politically. He took a deep interest in educational matters, being a commissioner of the New York board of education; he was likewise the editor of various newspapers in the city of New York, grand master of the freemasons of the state of New York, and an active member of the New York Chamber of Commerce. He married (1) Sophia Phillips and (2) Miriam Trimble. The first of the family to settle in America; bron 1736, the place of his birth being variously given as Busick and Frankfort-on-the-Main; died at Philadelphia, Pa., Jan. 29, 1803; son of Aaron Phillips. He emigrated to America from London in Nov., 1756, and at first resided in Charleston, S. C., where he was employed by Moses Lindo. He soon removed to Albany, and thence, shortly afterward, to New York, where he engaged in mercantile pursuits. As early as 1760 he was identified with a lodge of freemasons in that city. In 1762 he married Rebecca Mendez Machado (see Machado). In 1769 he became a freeman of New York. At the outbreak of the American Revolution Phillips favored the patriot cause; and he was an ardent supporter of the Non-Importation Agreement in 1770. In 1776 he used his influence in the New York congregation to close the doors of the synagogue and remove rather than continue under the British. The edifice was abandoned; and, with the majority of the congregation, Phillips removed to Philadelphia, where he continued in business until 1778. In that year he joined the Revolutionary army, serving in the Philadelphia Militia under Colonel Bradford. (1) Rachel Phillips: Born 1769; died 1839; married Michael Levy, and was the mother of Commodore Uriah P. Levy of the United States navy. (2) Naphtali Phillips: Born 1773; died 1870; married (1797) Rachel Mendez Seixas (d. 1822) of Newport, R.I. One year after her death he married Esther (b. 1789; d. 1872), the daughter of Benjamin Mendez Seixas. 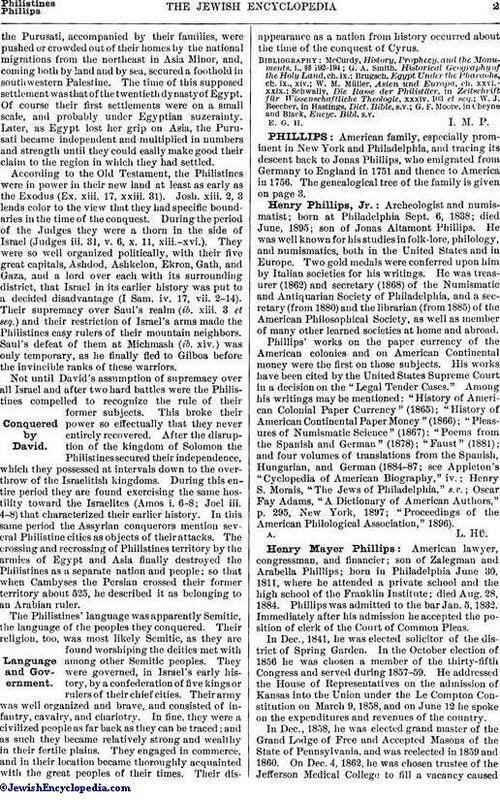 Phillips was the proprietor of the "National Advocate," a New York newspaper, and was also president of Congregation Shearith Israel in that city. (3) Manuel Phillips: Assistant surgeon in the United States navy from 1809 to 1824; died at Vera Cruz in 1826. (4) Joseph Phillips: Died 1854. He served in the War of 1812. (5) Aaron J. Phillips: Actor and playwright; born in Philadelphia; died at New York in 1826. He made his first appearance at the Park Theater, New York, in 1815, and was successful in Shakespeare's "Comedy of Errors." Later he became a theatrical manager (see Charles P. Daly, "Settlementof the Jews in North America," pp. 102-103, 120, New York, 1893). (6) Zalegman Phillips: Lawyer; born 1779; died Aug. 21, 1839. He was graduated from the University of Pennsylvania in 1795, and became one of the leading criminal lawyers of Philadelphia. 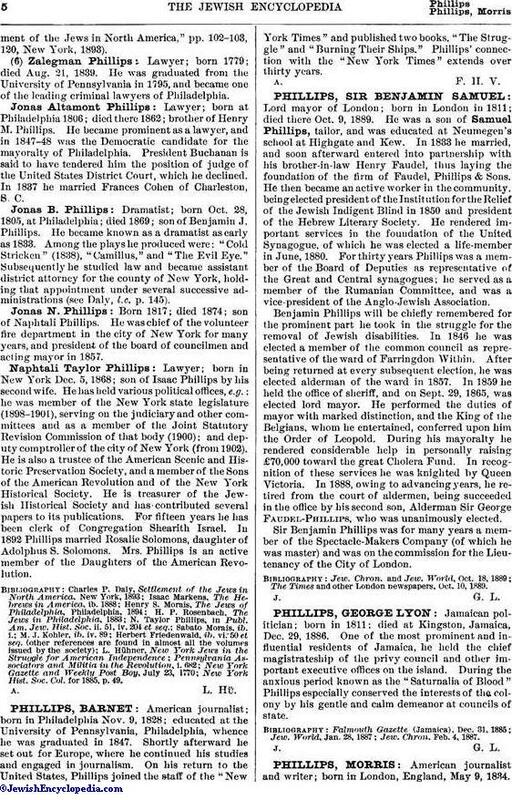 Lawyer; born at Philadelphia 1806; died there 1862; brother of Henry M. Phillips. He became prominent as a lawyer, and in 1847-48 was the Democratic candidate for the mayoralty of Philadelphia. President Buchanan is said to have tendered him the position of judge of the United States District Court, which he declined. In 1837 he married Frances Cohen of Charleston, S. C.
Dramatist; born Oct. 28, 1805, at Philadelphia; died 1869; son of Benjamin J. Phillips. He became known as a dramatist as early as 1833. Among the plays he produced were: "Cold Stricken" (1838), "Camillus," and "The Evil Eye." Subsequently he studied law and became assistant district attorney for the county of New York, holding that appointment under several successive administrations (see Daly, l.c. p. 145). Born 1817; died 1874; son of Naphtali Phillips. He was chief of the volunteer fire department in the city of New York for many years, and president of the board of councilmen and acting mayor in 1857. Lawyer; born in New York Dec. 5, 1868; son of Isaac Phillips by his second wife. He has held various political offices, e.g. : he was member of the New York state legislature (1898-1901), serving on the judiciary and other committees and as a member of the Joint Statutory Revision Commission of that body (1900); and deputy comptroller of the city of New York (from 1902). He is also a trustee of the American Scenic and Historic Preservation Society, and a member of the Sons of the American Revolution and of the New York Historical Society. He is treasurer of the Jewish Historical Society and has contributed several papers to its publications. For fifteen years he has been clerk of Congregation Shearith Israel. In 1892 Phillips married Rosalie Solomons, daughter of Adolphus S. Solomons. Mrs. Phillips is an active member of the Daughters of the American Revolution. New York Hist. Soc. Col. for 1885. p. 49.